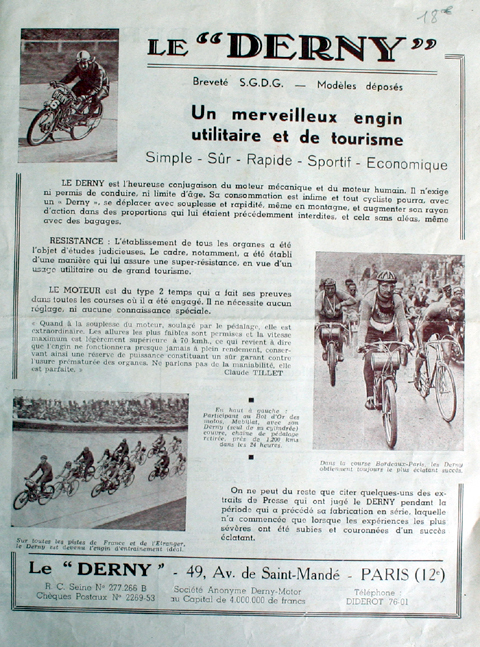 The Derny is famous in France. Its design has hardly changed from that of the earliest motorcycles – essentially a bicycle with an engine attached. It’s front-mounted petrol tank is particularly distinctive. Its fame is as a result of solo Dernys being used as pacers. In fact, the word ‘derny’ has become a generic term for motorized pacers. Motorized tandems are a uniquely French thing. A few vintage ones are now being rallied in Britain, though I’ve not yet seen anything as brilliantly ungainly as this Derny tandem. The engine is a beast of a 98cc Zurcher. The engine has good compression. It’s an excellent project that’s waiting for someone to restore it to its former glory. I bought new tyres for it and fitted them (£50 the pair from Tony Etheridge). But we got side-tracked; I restored another French tandem, and I now have several other restorations on the go; so the Derny got put back into my storage, which is why I’m selling it. This Derny is complete except for the chain-case on the off-side (see above). But I bought another Derny tandem to use as spares, which has the chain-case needed. (See page 91 of this auction catalogue CLICK HERE). The second Derny tandem will be in another of today’s auctions, and will finish after this one so that the successful buyer can buy it too if they wish: the second one has an incorrect engine and no petrol tank, so it should be cheap enough to buy for spares. I’d like to see photos of the Derny tandem when it’s done. 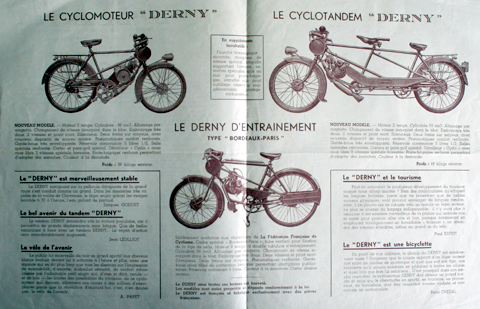 The idea of the Derny was designed and constructed by two French ex-racing cyclists called Roger Derny and Sons. This was the conventional “motos de stayer” (in the UK, “Big Motors” is the term used today). These type of pacing machines used first for the Bordeaux-Paris were not very reliable for road use. So another type of pacing machine had to be designed. And as a result the Derny was born and put into production in 1938. I have a Cyclotandem Derny for restoration, which is also in this 2nd BuyVintage auction. You can see it on page 43 of this website catalogue. The tandem and the pacer would make an excellent pair! This rare Derny is owned by my pal Peter. He bought it from our mutual friend Richard, but neither of them have had it running. In fact, these pacers are quite hard to ride – so there’s a challenge for the successful bidder! That is what we really like about cyclemotors: they are reminiscent of the earliest pioneer motorcycles. And the Derny, with its distinctive handlebar-mounted petrol tank and the sizeable Zurcher (98cc) engine between your legs, has the most primitive pioneering early-20th Century styling of them all.